Last Saturday, members of Bay Area Intactivists spent the day educating expectant parents and birth support providers at the Bay Area Birth Information fair in San Jose, California. 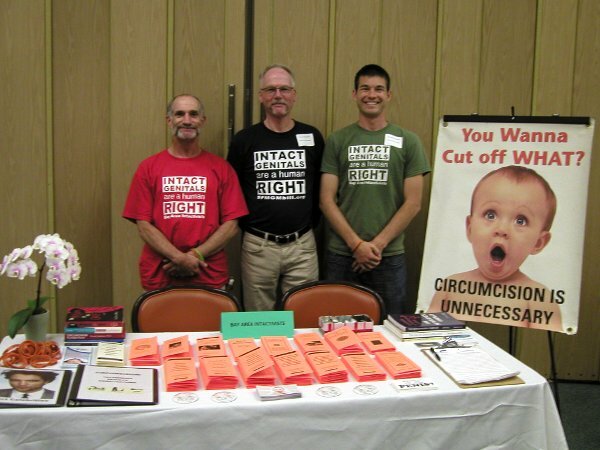 Throughout the day, intactivists received praise from fellow vendors, Meet BABI organizers, and event attendees for their work to end non-therapeutic, infant and child circumcision. Pamphlets covering topics such as the functions of the foreskin, the damage caused by circumcision, non-surgical foreskin restoration, and Brit Shalom (an alternative naming ceremony for Jewish families) were distributed. The intact celebrities binder, a booklet depicting male celebrities who have not undergone circumcision, was particularly popular. Plans are already underway for Bay Area Intactivists to be at the next Meet BABI fair on August 13 in Palo Alto, California.